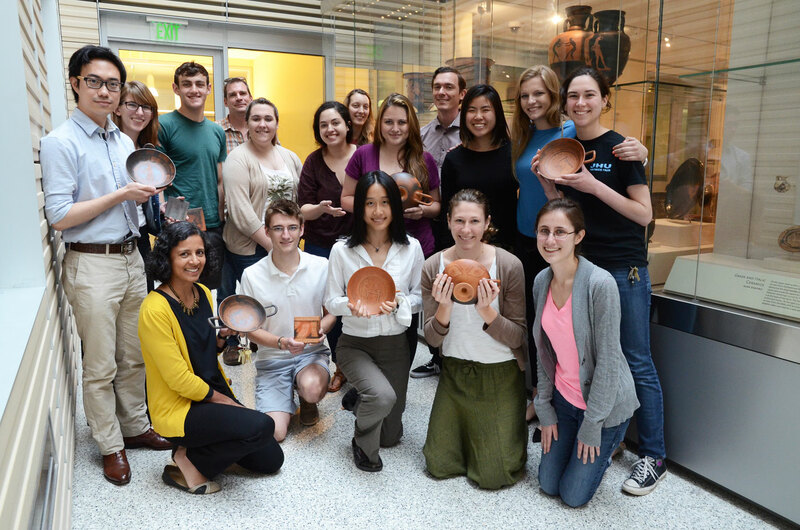 The class participants with completed wares standing in front of the case of ancient examples. This week brought the end of our 13 week experiment. Meeting again at the museum, students gave individual and group presentations outlining how they decorated their tiles and kylikes and what worked and what did not. There was broad agreement on some things (like the need for a saggar box–a protective container to shield the wares from being scorched in the kiln during firing) and some differences of opinion (like the necessity of burnishing after applying slip). All in all, everyone was pleased with all we had learned this semester. We also got a sneak preview of our radio segment on Humanities Connection on WYPR (airing May 7th at 5:44 PM on 88.1 FM), and the film documenting our class through the semester. Looking back on all we took on in this class, it is almost unbelievable. Just spending a semester studying the history of ancient Athenian pottery would make for a substantial and engaging class, but we went much further. As we apprenticed ourselves to craftsmen of twenty-five hundred years ago, it was truly a learning experience for instructor and student alike. We took advantage of previous experiments in the replication of Athenian pottery, carried out over the last century, but these were just our starting points. We have Toby Schreiber to thank for her studies of the forming of ancient vases, Joseph Noble for his work on decoration techniques, and Eleni Hasaki for her study of ancient kilns (the list of scholars to whom we owe a debt could go on much longer! Some of them are listed here), but our project synthesized many theories about the various steps in the production of Athenian vases to try to recreate the entire process. We met some hurdles along the way. Making a useable slip to paint the figures and designs on the pots was easier said than done. After separating out the excess water and heavier particles from the clay, it was still too watery to paint with. The solution turned out to be rather simple: letting it sit for a few days so excess water could separate and evaporate out. Unfortunately, two of our kylikes did not make it into the kiln completely intact. During the firing, some pieces were damaged by an exploding tile. These were reminders of the losses that must have been a regular part of work in ancient pottery workshops. This class was truly an experiment in that every step was based on careful consideration of the evidence available, and although we had an idea of what the outcome should be, we were never completely certain of what the end result would be until we finished. But this is not the end of this project. In a way, this class was one phase of a broader project involving a larger scholarly dialogue about the production of Athenian vases. We will hopefully fire our kiln again in the coming months, trying to learn from our first experience. We hope to present our findings as widely as possible at academic symposia and eventually publishing what we have done. Keep an eye out for our next steps!